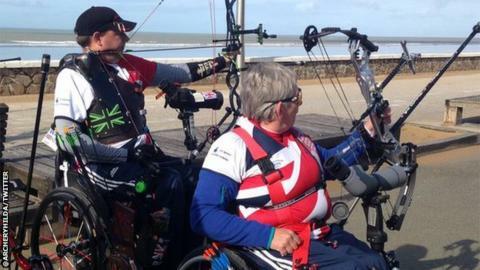 Britain's Jo Frith retained her women's W1 title at the European Para-archery Championship in France. It was Frith's second gold medal of the competition after she partnered John Walker to team gold on Saturday. Former swimmer Frith, 54, from Glastonbury, beat 16-year-old team-mate Jess Stretton to secure a 136-127 victory. Frith led her young opponent 28-23 after the first of the five ends and was never headed after that. Vicky Jenkins was third to make it a GB clean sweep while there was also bronze for the women's recurve team of Hazel Chaisty, Amanda George and Tania Nadarajah. In the non-Paralympic visually-impaired discipline, Steve Prowse emerged victorious. However, the men's compound team of Mikey Hall, John Stubbs and Nathan Macqueen lost 202-174 to Ukraine in their bronze medal match. Earlier in the week, Macqueen earned another Paralympic qualification slot for Great Britain to make it 10 in total. Frith and Walker's team gold, thanks to a 140-121 win over Russia, means they hold both the European and world titles and will be hoping to complete the set with the Paralympic title in Rio in September.